We were thrilled to receive some beautiful pictures of one of our client’s recent wedding – there is always great excitement in the office when we see photographs of our dresses on their big day! 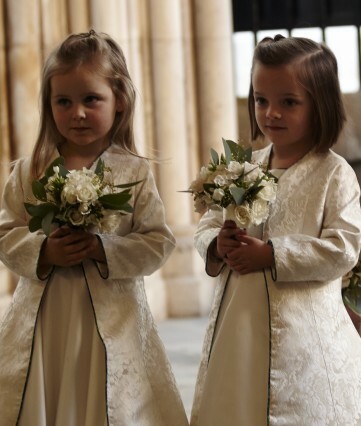 Victoria’s four flower girls wore full length coats made in a beautiful ivory brocade, lined with satin and piped with the family tartan. The dresses underneath were made in a sumptuous ivory duchess satin with a circle skirt and a bodice piped with the tartan. I’m sure you’ll agree they looked absolutely beautiful. If you would like more information about our bespoke service, get some inspiration from our bespoke gallery here and don’t hesitate to contact us if you would like to discuss your requirements further.